Have you ever wondered what you’d look like if your eyes were a different color? Mine are gray, but I’ve always thought brown would suit me. 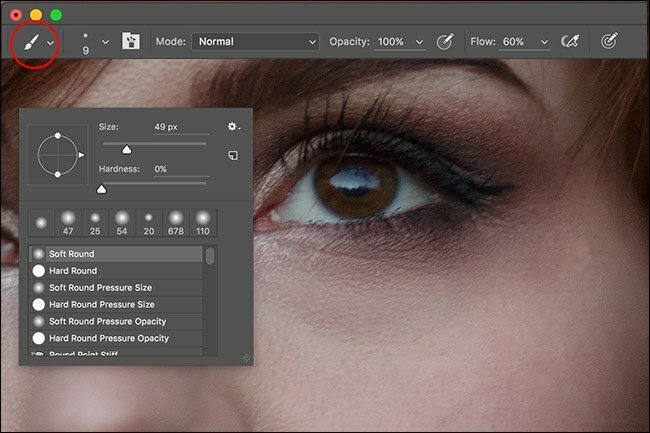 Sure, you could go and buy colored contacts, but it’s far simpler to just use Photoshop—or your favorite free image editor like GIMP—to change your eye color. I’m going to demonstrate the technique using Photoshop so, if you’re using a different app, you just need to work out which equivalent tools are the most appropriate. The instructions should work in plenty of image editing programs. Open the image you want to use in Photoshop. This is the image I’m working with. 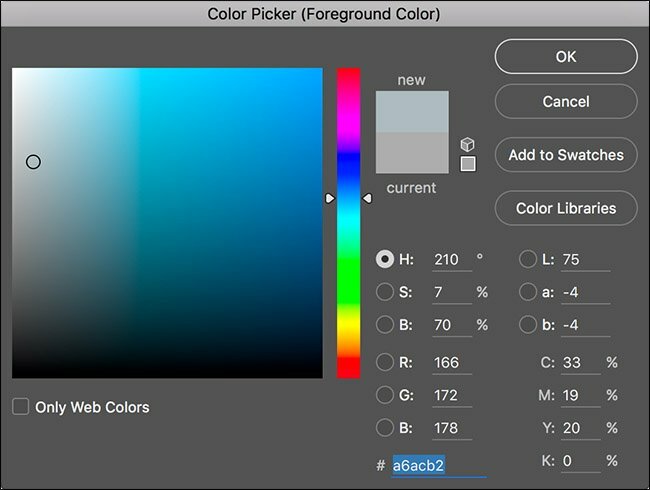 To start, create a new blank layer with the Blend Mode set to color—the keyboard shortcut is Control+Shift+N for PC users, Command+Shift+N for Mac users. Then, under the “Mode” dropdown, choose “Color”. 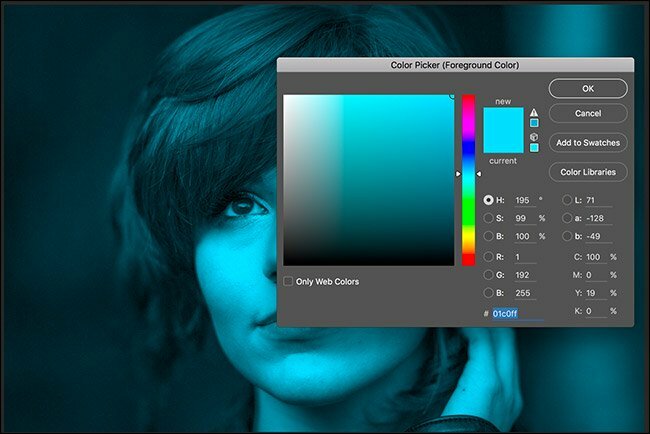 Double-click on the foreground swatch and set it to a crazy color like the light blue in the image below. Go to Edit > Fill and select Foreground Color to fill the blank layer with this color—you can also use the keyboard shortcut Alt+Backspace (on Windows) or Option+Delete (on a Mac). Everything in your image will now look a weird shade of blue. This is going to help you select out the eyes. 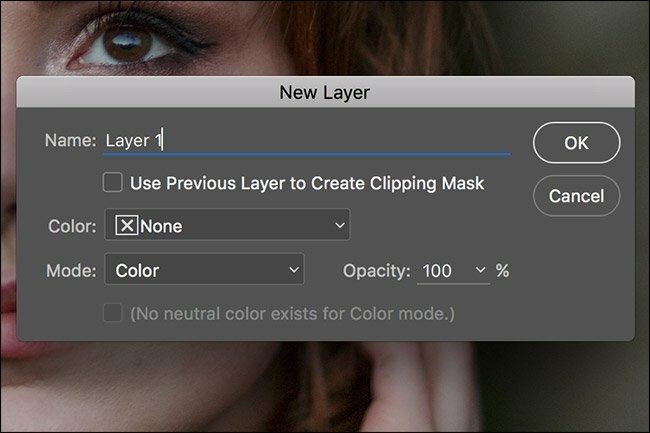 Add a black layer mask to the color layer by holding down Option or Alt and clicking on the New Layer Mask button. Remember, with a mask, white reveals and black conceals. 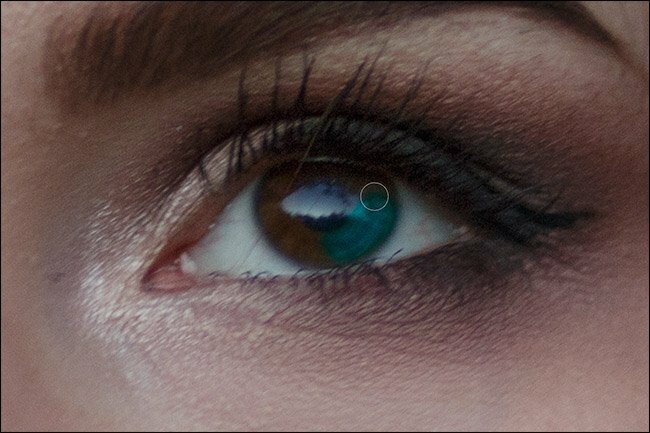 Zoom into the subjects eyes (Control-+ on Windows, Command-+ on Mac) and select the Brush tool by pressing B on your keyboard. Select the Soft Round bush from the Brush menu, set the Opacity to 100%, and the Flow to around 60%. Reset the color swatches to their default values of black and white by pressing the D key, and then swap them so you have white as the foreground color by pressing X. The mask probably looks a little painted, so go to Filter > Blur > Gaussian Blur and add around 2 pixels of blur to the mask. This will smooth out the transitions. Now that you have a good mask for both the eyes, it’s time to start coloring them a more natural shade. Select the color layer, then double click on the foreground color swatch. For blue eyes, set the H to 210, S to 7, and B to 70. For gray eyes, set the H to 210, S to 3, and B to 70. For green eyes, set the H to 100, S to 4, and B to 80. For brown eyes, set the H to 40, S to 25, and B to 15. Dial in whatever color you want to use and press OK. Go to Edit > Fill and then select Foreground Color to change the subject’s eyes. Depending on the subjects base eye color, you’ll also need to brighten or darken the iris to make things look natural. 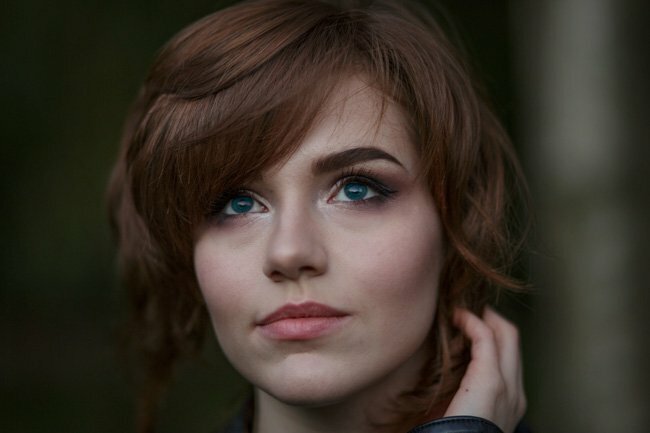 Rebecca, the model in the photo I’m using, has dark brown eyes, so they need to be brightened up quite a bit. For my own lighter gray eyes, I often have to darken things. Add a Curves Adjustment Layer to the image. It’s the best way to adjust brightness in Photoshop. 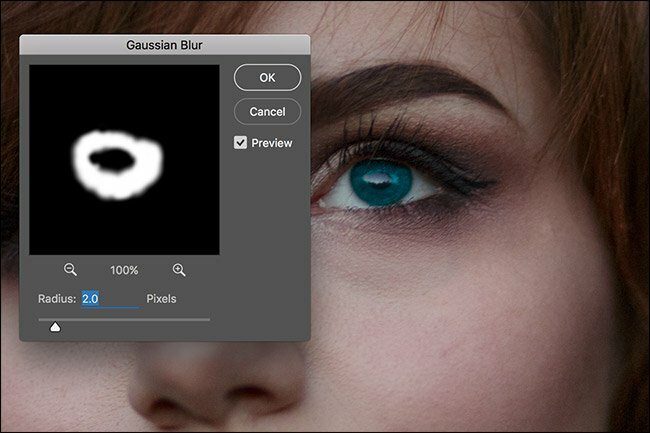 You’ve already made a great layer mask so there’s no point doing it again. Hold down Option or Alt and drag the layer mask from the color layer to the Curves layer. Now the Curves will only affect the eyes. Pick a point on the curve and drag up to brighten the eyes or down to darken them as needed. The values I’ve suggested in this article are just a starting place. Every image is unique. While most of the time the colors I recommend should give you a natural looking eye color, if they don’t look right to you, tweak the color and curves layers until they do. 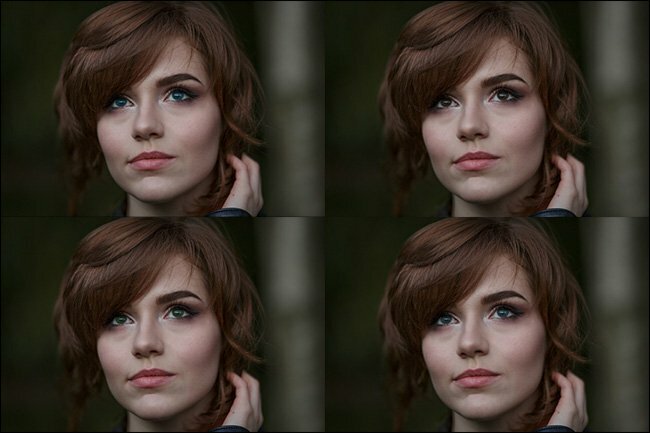 Changing your own, or a friend’s eye color, in Photoshop is great fun. Everyone wants to know what they’d look like with blue or green eyes. 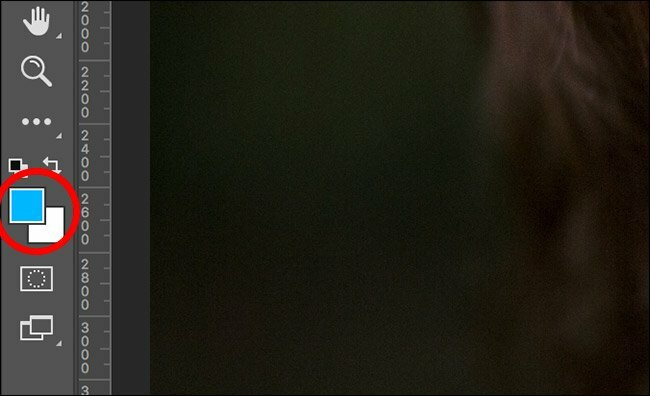 You don’t have to limit yourself to natural eye colors, either–the same technique can be used to make wolf-like yellow eyes or Targaryen purple eyes.